1. 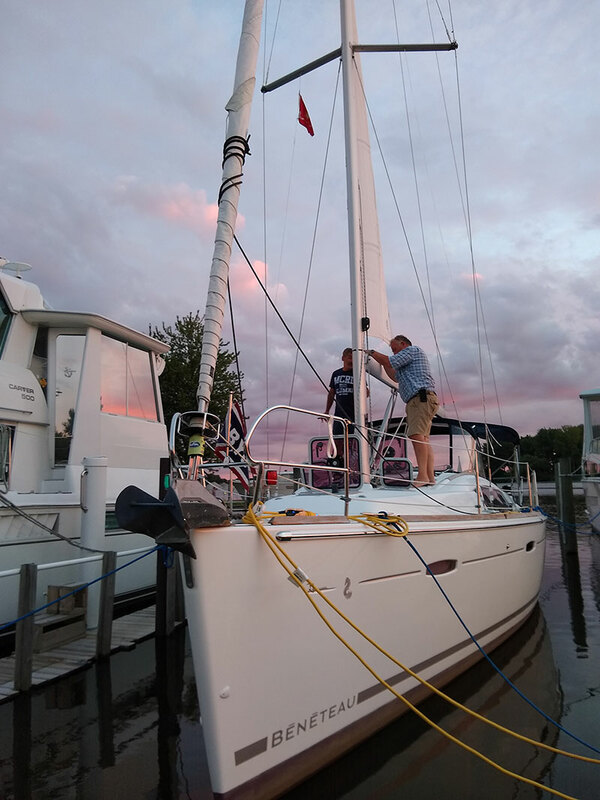 In October (on, or around the 1st) of the current year, the Dock Committee shall send to all members with Full membership status, an application and deposit request for a slip assignment for the forthcoming season. In order to receive priority consideration, all Dock Applications and Deposits ($200.00 non-refundable) are to be received at the Club Office by the designated date in November (on or around the 15th.) All incoming Full members thereafter may request an application from the Club Office. 2. The Dock Committee, subject to appeal to the Board of Directors, will make all slip assignments. 3. The Dock Committee shall make assignments, giving consideration and highest priority to those members who request to remain in the previous year’s assigned slip. The committee shall make all assignments based on the most effective utilization of slips, giving due consideration to the length, width, and draft of all boats. Slip assignments will be made only to those Full members whose Club account is current. This assignment, along with the remaining Mooring Fee balance will be mailed with the December 31st billing (January’s statement) and due no later than the final day of February. Slips that are not paid in full when due will be reassigned at once. Upon reassignment of a slip to another dock holder, it will be with the understanding that that slip may, or may not be reassigned to them the following year. However, they will be assured of a dock in the upcoming year. 4. Mooring Fees (detailed on the application under “slip options”) are deemed “non-refundable”. If a condition exists that will not accommodate the member’s boat, an alternate slip will be assigned. If an alternate slip is not available, the member may choose to take the Mooring Fee as a house credit (food and beverage only), or have the Mooring Fee applied to the following year’s dockage. If a slip is still unavailable in that year, the member will be given a credit on his/her house account. House credits granted will expire at the end of the given calendar year. 5. All boats that are moored, or dry stored, at SBYC with MC numbers, must be registered on the member’s Dock Application. 6. Any member who has been assigned a slip must use that slip during that season. No sublease by a dock holder will be permitted. 7. In the case of multiple ownership, or use of a boat, a slip assignment cannot be made unless all parties are Full members of the Club (Social, Non-Resident and Complimentary status is not valid). One (1) member only, who has the least amount of points, will be considered the dock holder. Dock initiation fees and dock seniority points will be credited only to the member with the least amount of points. A. One (1) point for each year of Full membership. B. Two (2) points for each year of slip leasing. C. Waiting List* – A list will be composed of those members who filled out an application for the year, but did not receive an assignment. Such list may be amended throughout the season as additional applications and assignments are made. The order of such applicants will be established by the date of the Board meeting at which each applicant became a member, with the oldest date receiving the priority number “1” and the newest date receiving the lowest priority number. All such applicants admitted at the same Board meeting will be listed as a group in membership application date order, with the group being assigned its appropriate number. Additional assignments during the season will be made in as close conformance with the numerical priority of the waiting list as permitted by the slips that become available. Within each group, the priority for making assignments will be based first upon the availability of each applicant’s boat for the available slip, and in the event of conflict, based on the date appearing on each applicant’s membership application, with the oldest date receiving the highest priority, and the newest date receiving the lowest priority. 9. The rental, lease, or charter of any boat to any non-member from any dock at SBYC is strictly prohibited. 10. Effective June 1, 2014 a dock holder in good standing, subject to availability of slips, may rent a second dock at ½ of what their second boat would normally cost for its size. The second boat must be titled and insured in the dock holder’s name. A certificate of insurance must be furnished for the second boat. The second slip will be a “floating assignment” meaning that if the Dock Committee needs the second slip for a new dock holder, an alternative second slip may be assigned. Dock holders will be responsible for filling out a utilities form and paying for utilities for the second boat. 11. Final Decision – the Dock Committee reserves the right to make all dock assignments, subject to appeal to the Board of Directors. Use of other slips and transfers are forbidden unless authorized by the Dock Committee. 1. No dinghies, prams, water hoses, etc. will be stored on lawns adjacent to the slips. Dinghies may be stored along with outboards, boat trailers, etc. in the areas so designated by the Dock Committee. Dry storage of boats on trailers will be allowed in the designated area. Storage Assignments will be made on written request, and by membership points should requests exceed space available. Annual fee for storage is stipulated on the Dock Application form. There is a one hundred dollar ($100.00) summer storage fee for slip holders and a three hundred dollar ($300.00) fee for all non-slip holders. As of December 1st of the current year, any boat remaining in Dry Storage will be considered “winter stored”. The fee for “winter storage” is one hundred dollars ($100.00) for both slip holders and non-slip holders. 2. If your boat trailer is at the Club, you must have your name printed on the tongue of your trailer, in such a location and size that is easily visible. 1. All dock holders are requested to notify the General Manager/Dock Committee Chair or Club Office whenever they expect to vacate their slip for an extended period of time. Departure and expected arrival dates, along with Electric Meter readings may be supplied in the “Member’s Log Book” located just outside of the Club Office. The Club reserves the right to sublease any dock during this time and collect revenues accordingly. Should your itinerary change, you must notify the Club immediately so that no conflicts occur. a.) Full Members, Junior Members, Surviving Spouse Members, and Life Members are not limited to any maximum number of nights per year, however, if their stay will exceed 10 consecutive nights, they must provide proof of adequate insurance. b.) Social Members and Non-Resident Members are limited to a maximum of 10 nights per year. c.) Transient boaters are limited to 10 nights per year and require the consideration and approval of the General Manager, Commodore or Dock Committee Chairman. d.) Reciprocating Yacht Club members are not limited to any maximum number of nights per year, however, if their stay will exceed 10 consecutive nights, they must provide proof of adequate insurance as well as evidence that they have a permanent slip assignment at their home Club. e.) Boats under 20 feet in overall length will be charged $10.00 per night. f.) Boats from 20 feet to under 40 feet in overall length will be charged $20.00 per night. 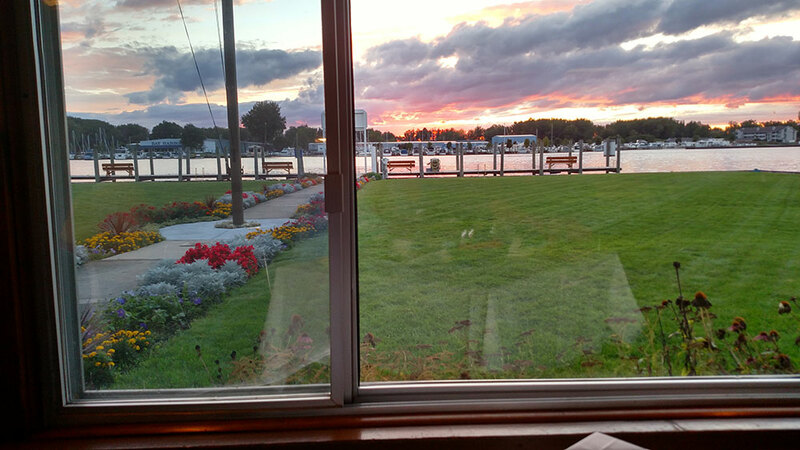 g.) Boats 40 feet in overall length and above will be charged $30.00 per night. 1. Each boat owner will be charged according to the point system “score card” that is included with the dock application. Points are determined by the appliances and accessories claimed on your boat. Points are determined by the boat owner on the “honor system”. Total points are multiplied by a factor of $13.00 to get a total seasonal charge. There is a five-point minimum per dock holder. The live aboard rate will be 1.5 times the standard rate. 2. All docks are equipped with a minimum of 125-volt outlets. In the event additional power is needed, arrangements may be made by securing permission from the Dock Committee Chair or General Manager, and shall be installed at the member’s expense. There shall be no disturbance of the existing device if any modification is made. A. The minimum shore power installation allowed on any boat shall be 30 amps. 125 volt. B. The shore power connecting cable must meet the following standards. 1.) Be rated for the service supplied to the boat. 2.) Be one piece (without splice) or cords with a locking collar are acceptable from the boat to the dockside receptacle. 3.) Have approved weatherproof fittings at both the boat and dockside receptacle. 4.) Absolutely no household type extension cords will be permitted for shore power connection. 5.) Absolutely no permanent wiring of any kind is to be attached to any dock unless approved by the Dock Committee. 6.) Dock power cord will be disconnected from power sources when boat is not present at the dock. 3. Generators – If electricity is provided, motor-driven generators are not to be used. It is forbidden to operate generators between the hours of 8:00PM and 8:00AM, and such an apparatus must be properly muffled when they are used. 4. Water will be provided from, on or around April 1st, through, on or around October 31st . 6. Hose nozzles with shutoff are required when using hose to wash boats. 7. Refueling of any boat at SBYC is absolutely forbidden anywhere on the Club premises or in the Club area. No exception to this rule will be made. 1. Repairs – Varnishing, etc. are permissible at the Club. However major repairs must be performed away from SBYC premises. 2. All dock boards, etc. are to be removed by November 10th. Arrangements may be made with the Dock Committee for the removal of such and will be billed at $10.00 per dock board. The Dock Committee will assume no liability for the storing, care or location of the dock boards as a result of this rule. Dock boards are to have both the member number and name affixed to them. 3. No dock shall be raised or lowered without permission of the dock committee. If approved, cost shall be at the expense of the dock holder and shared dock holders must be in agreement. Any decision to raise or lower docks will be based on projected water levels. 4. No motors are to run for the purpose of charging batteries after 10:00PM. 5. It is forbidden to use any carpeting on the docks or walks, except on raised steps for the purpose of safety in the boarding of your boat. No piling shall be carpeted in any slip. 6. Dock boxes are to be made of fiberglass. Wooden dock boxes are no longer acceptable. The fiberglass boxes will be white. The fiberglass box is to approximately conform to the existing boxes not to exceed heights by more than 6 six inches. Dock boxes may be used on the front of the lawn of the slip. 7. Boats moored at the docks, or at an anchorage, shall not discharge any garbage, sewage, or organic waste into the water at any time. 8. Use the pump-out only to empty your porta-potty. Do not use the club toilets. 9. Trash containers are placed at the Club for your convenience. It is required that all trash be deposited in the appropriate containers. One container is reserved for corrugated (cardboard box) materials only, and one is reserved for common trash items only. Absolutely no hazardous materials (oil, batteries, antifreeze, etc.) will be allowed. 10. Carts provided at the Club are to be used for carrying supplies to individual boats and are to be returned to their storage areas immediately after use. Under no circumstances are these carts to be used for trash storage at any time and fines may be imposed for violation of this rule. 11. Dock holders on North/North slips have two (2) gates for loading and unloading vehicles. These vehicles must be moved back to the SBYC parking area and shall not remain on Anderson’s Marina road. These gates will remain locked at all times. Keys for dock holders are available at the Club Office. 1. All dogs or other pets must be kept on a leash when off of the boat, and shall be the owner’s full responsibility for any and all actions at all times, including clean up. 2. Parents with young children will provide and assure the wearing of life preservers by their children at all times when on docks, club guest dock, and near the river or boat slips. 3. Persons under 18 years of age are not allowed to remain on boats overnight without parental or adult supervision. 4. Members allowing non-member offspring use of member boats: Use of moorings and dry storage area is restricted to members, his/her non-member offspring and their guests. No other individuals will be permitted on the docks or boats without the member or non-member offspring being present. If a non-member offspring is going to be on a boat, a courtesy call to the Club would be appreciated. As always, the member will assume all responsibility. 5. All crew members of racing sailboats, who are not members of SBYC, must park their vehicles in the area located at the southeast end of the club property adjacent to the fence. 6. The discharge of firearms, air, or pellet guns, or throwing of propelled objects is prohibited in or around Club property. 7. It is absolutely forbidden to have open fires on boats or docks. 8. After 10:00PM no unnecessary noise (blowing of horns, stereos, etc.) will be permitted. Sailboats must secure all halyards to prevent slapping against the mast while dockside. 9. The discharge of cooling water from on-board air conditioning and refrigeration units shall be in such a manner as not to cause a disturbance or annoyance to other dock holders. 10. Picnic Tables – All picnic tables are required to have two (2) runners attached to the legs of the table to facilitate movement by the grounds crew. Member name and number must be affixed to the underside of one seat board for identification. 11. 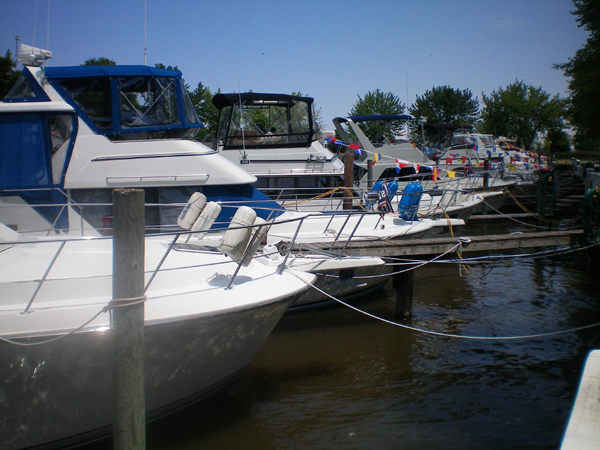 The use of “FOR SALE” signs on boats while kept at the Club is strictly prohibited. 12. When a General Manager is on staff, he or she shall be a permanent member of the Dock Committee. 13. No boat shall be left in the water after November 1st without prior consent of the General Manager or Dock Committee. 14. SBYC will not assume any responsibility for any loss or damage to boats or other personal property arising from “theft or vandalism”. It is the members’ sole responsibility to provide appropriate insurance coverage for all such risks from boats, vehicles, and other personal property. 15. The SBYC front Guest Dock is available for temporary dockage. The area adjacent to the pump out station shall be vacated immediately after use. 16. The foregoing Dock Rules may be altered, amended, suspended or repealed at any duly constituted meeting of the Board of Directors. “A” Dock minimum is $1,400.00 plus $15.00 per foot over 40 feet. “B” (Floating) Dock minimum is $1,100.00 for boats up to 25 feet. Eligibility: Full, Social, Junior, Surviving Spouse, Life and Non-Resident members are allowed to bring their RV and use it as outlined below. The members are allowed to have guests visit or stay with them in the RV but, as outlined in the House Rules, the member must be present and they are responsible for their guest(s) while they are on the grounds. Guests are allowed to use the bath house for lavatory ad shower needs. Limitation: There will be a limit of three RVs arriving at the same time with no reservation, priority will be given to those with the seniority Club membership. Location: RV’s will be parked on the grass located by the south basin along the fence on the eastside of the property near the entry gate. Length of stay: RVs will be limited to three days per stay with a maximum of 10 days per year. NOTE: Social and Non-resident members do not have gate access keys and may request a key (1) for use during their stay and must be returned at the time of departure. There will be a $50 deposit for the key. RV definition: RVs are described as motor home, 5th wheel or trailer with fixed sides. Pop-up campers and tens are not allowed. The RV must be in good repair and appearance and if questionable, the Flag Officers and/or Dock Committee will have the final say. The use of awnings (those attached to the RV) and temporary quick setup shade tents may be used but cannot encroach on the roadway in front of the RV. Amenities: RVs will be able to use power and water from pedestals located on the east end of the south basin. Owners must provide their own power cords and hoses. If the RV needs more power than available at the pedestal, the owners must use their own power source (generator). Any use of a generator must follow the same rules that apply to generator use by dock holders. Other restrictions: Campfire and use of charcoal grills are expressly forbidden. The foregoing RV rules may be altered, amended, suspended or repealed at any duly constituted meeting of the Board of Directors.